For a long time, Meebo has been a widely liked company with lots of funding but a fairly small amount of revenue. This year, that started to change. The company’s Meebo Bar (AKA Community IM) has now been deployed to over a hundred major sites and has helped Meebo reach nearly 100 million unique visitors monthly. And today, it’s launching a feature that will see that number take a huge jump: a self-serve tool for implementing the Meebo Bar yourself. Last week I spoke with CEO Seth Sternberg about Meebo’s recent growth, the impact of the new self-serve tool, and how he sees Meebo’s outlook over the next year. 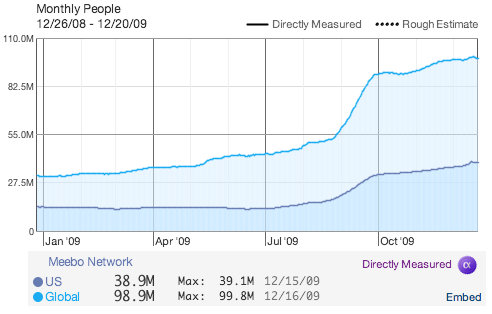 Sternberg says that Meebo started 2009 with around 30 million uniques, almost all of which came from the site’s chat portal at Meebo.com. The Meebo Bar has added nearly 70 million more visitors in one year. The product was originally announced back in July 2008, and launched late that year on Flixster. Since then, it’s been deployed to 130 partner sites, with 150 more contracted partners ready to deploy it in the near future. Unfortunately for small-time bloggers, the Meebo Bar had to be installed with some help from Meebo, as there was no way to integrate it yourself. Sternberg says that the site initially decided to focus on the “torso sites” of the web — sites with over 1 million unique visitors, but under 20 million. That encompasses quite a few popular sites, but it excludes the countless longtail content sites and blogs that could also benefit from the Meebo Bar. Sternberg says that Meebo receives 75 Emails a day from smaller sites requesting the bar. Today, they’re getting their wish. For sites that integrate the Meebo Bar, Sternberg reports increased engagement and sharing across the board. He says that on sites like MyYearBook and Justin.tv, 35% of all users wind up chatting with their friends using the integrated bar. Perhaps more important to site owners is his followup stat: users tend to share twice as much content using the bar’s integrated Twitter/Facebook/Yahoo/Email sharing tool than they do using more traditional share buttons. He attributes this largely to the fact that users can simply drag and drop an item to share it with a friend, which most people are comfortable with. But the Meebo bar isn’t perfect. Sternberg acknowledges that on some content sites (he singled out tech sites) sharing hasn’t seen such a big increase. And he says the flow to get people using the chat bar, which involves setting up a Meebo account and inputting your credentials for various chat services, could use some work. The conversation then shifted to Meebo’s future. Sternberg calls 2010 Meebo’s “pivot year”: it’s the year that Meebo is going to start earning some serious money. Sternberg is optimistic about the site doubling up on its unique users, with hopes to reach 200 million monthly uniques. And he thinks Meebo can turn those users into added revenue: the company has been getting strong traction with major brands, who are ordering much larger ad campaigns than they were when the Meebo Bar was first launched. The company itself is growing too. Meebo started 2009 with 35 people and has since doubled its headcount, with plans to boost that number significantly over the next year. From the looks of things, the Meebo Bar is shaping up to be a major hit. Now the question is just how much of a hit it will be with advertisers over the long term. Meebo has nearly $40 million in funding, so investors are going to want to see that revenue stream turn into a full-blown torrent.